WP Fusion includes the ability to detect lead sources from a marketing tools, such as Google Analytics. You can even easily create your own lead source tracking scheme to collect just the data you need from your visitors. The system is quite versatile. It can look for a variety of common lead source parameters passed in URLs to your site and store these as a cookie when the user first visits your site. If a user then registers for your site, or makes a purchase, the detected lead source will be sent to your CRM. The cookie is valid for 90 days. So even if a user leaves your site and comes back later to make a purchase, you can still capture the source that brought them to you in the first place. If you’re using Google Analytics’ Campaign URL Builder, Google will generate tracking links to your site that look like https://mysite.com/?utm_source=facebook&utm_campaign=summer_ad. You can enable each of the various Google Analytics tracking variable for sync from the Contact Fields tab in the WP Fusion settings. 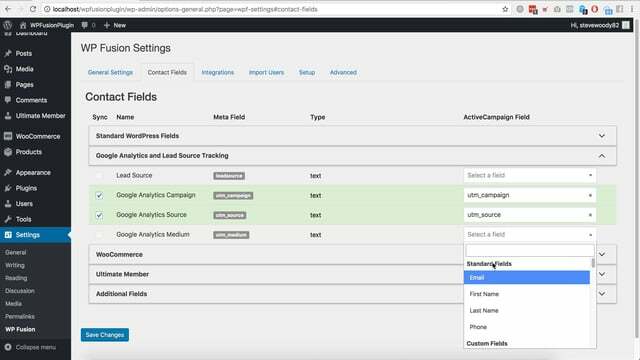 To enable custom lead source tracking, locate the leadsource field in the Contact Fields list and map it to a field in your CRM. Make sure to check the Sync box to enable the connection. Structure the URL to your site like https://mysite.com/?leadsource=custom_leadsource. Anything after the leadsource parameter in the URL will be synced. Using this method you can set up your own lead source tracking strategy however you see fit. The fields Original Referrer and Landing Page are a bit different in that they don’t use a URL parameter for tracking. Original Referrer: This tracks the URL a user followed to get to your site. If this is enabled, the referrer URL will be recorded on their first visit. Landing Page: This tracks the page the visitor landed on when they came to your site for the first time.